Twenty years ago, I spotted a small b/w photo buried in the back of a catalog of Osaka prints belonging to an American museum. 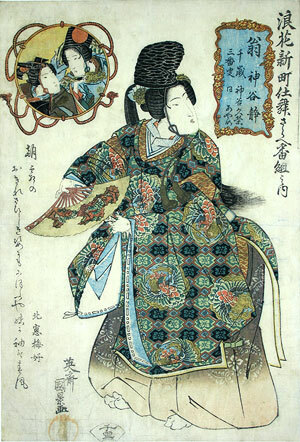 At first, it seemed to a nerimono beauty print, the kind that depicted a courtesan masquerading as a literary or historical figure in her pleasure district's annual costume parade. This genre dominated production of single sheet bijin-ga in Kansai, what little of it there was, in the first half of the 19th century. However, the title on the deluxe ôban piece — Naniwa Shinmachi Shimai-sarae Bangumi no uchi — ruled nerimono out. Shimai-sarae implies a performance of Nô dance, a far more august cultural activity than a fashion parade and something not easily associated with the brothel quarters. The museum had snared a very exceptional piece — the kind of intriguing, ultra-rare item that stimulates lust in scholar and collector alike. As it turned out, I needed to wait a mere two decades — an instant for a dedicated Osaka fan — for another impression (Fig. 1) to turn up and get lodged in my portfolio. The hunt finally over, now comes the fun of conjecturing about the print’s meaning. In the late Edo period, Nô was revered by the ruling class as the ancient, hieratic soul of Japanese theater. Solemn, ponderous and austere, not to mention officially off-limits for commoners to practice, everything about it might easily have been scorned by the teahouse world. Instead, there was something of a fashion among the merchant class to take up the study of the strict rhythms and deliberate movements of shimai, as well as the distinctive declaiming and chanting that accompanies it. Hence the phenomenon of amateur recitals by townsmen, the model for the performance chronicled in Fig 1. Not recorded on the sheet is the venue. The event might have been held at a local Nô stage — a nearby temple boasted a popular one − in which case it was perforce a community fund-raising event. Alternatively, the teahouse's patrons (Shinmachi was the smallest of the city's teahouse districts, but judging by the print record the most vibrant) may have piled into a cozy neighborhood theater. Each demi-mondaine district had its own performance hall, similar to the vest pocket theaters still operating today in the Gion in Kyoto. To be sure, shimai was not part of a typical courtesan's skills set. It is possible that Shizuka had a personal love of the form — note her correct dance posture, a far cry from the beauties merely posing in Nô costumes in nerimono — combined with her owner or sponsor being willing to pay the high lesson fees for the chance to present something novel to Kamiya's habitues. Given a pleasure quarter's penchant for spoofs and general light-heartedness, however, it is perhaps more likely that classic form and content were not crucial to the occasion. What the audience may have seen was akin to a charming rendition of, say, "Nô, Nô, Nanette." Regardless, a tidy sum was expended. In addition to the resplendent Nô costumes, which standard shimai eschews but a courtesan cast demands, the sponsor would presumably have paid as well for the entire edition of the print, to be handed out as gifts. Tell-tale wear of key block lines suggests the edition numbered well over one hundred, presumably each as deluxe (elaborate printing to match the intricate carving, and lavish application of costly brass pigment) as Fig 1. The print is curious in several other regards. The signature is that of Eisai Kunikage (active 1818-44), a student of Toyokuni I from Edo. This man long worked in Osaka as a block-copyist (the one who transfers the artist’s design onto thin paper for the carver to work from), but seems to have never designed another print there. Nor can one find elsewhere the publisher’s mark — read as "Senri" but written with different characters than the firm of the 1820’s highlighted in Daruma 50. As for the poet involved, probably the sponsor using his poetry circle nom de plume, Hokusô Baikô is equally unknown. What is one to make of all this? Why did this particular shimai performance by Shizuka and friends provoke a group with no print-making experience to create a work of rare extravagance… one, moreover, that stands out as a category of one in the ever-widening list of Osaka woodblock genres. This article originally appeared in Daruma, no. 53, Winter 2007. Copyrighted © text and pictures reprinted with permission.